Well, mine arrived missing its tip, but not too bad. I like the balance of this sword. Blade is straight, sheath good. I was happy with my purchase of this blade, but as other reviews have said, it is a very short sword. The quality is pretty nice, but my blade came not straight at all. I don't mind too much because it will be a display peice but still. The handle is great and sturdy. I don't know why the hand guard points down, it digs into your hand if you try to hold it too close to the blade. The sheath is one of the best things about this sword, I actually use it for some of my other swords from budk as well. The sword is nicely made, but, it just isn't Celtic. It looks more like a barbarian sword used by the Germans against the Romans at the Battle of Teutoberg Forest. The Handel is huge and well polished. The blade was thick, easy to sharpen, but, I really wish it was half again to twice as long as it is. Thanks BUDK for an awsome (German) sword. This is a very nice piece. It has a good weight and feel in my hand, authentic looking from the era and was a very nice addition to my collection. Highly recommend this piece. Just got it in the mail, nice sword and its awesome, sharp right out the box my friends are jealous. Pakistan does good work! One of the better buys at Bud-K. I wouldn't buy it if it is made in India, China is OK, and Pakistan is the best! It is sharp, actually has a mirror polished blade, a wooden handle, nice brass work on the hilt and pommel, a unique design, and at a good price. A must buy for anyone interested in quality. Only draw back is it is a little bit short. Another six inches on the blade would have been nice. Still, one of the best buys from Bud-K so far......No wonder it has to be restocked! Get it while it is still available. Believe other five star reviews. This sword is great! Solid sword! No loose parts. Feels great in ones hand! Great looking and great price! very happy! Thank you! I purchased a pair of these swords a couple of years ago ....very well made, nice solid wood handles with brass appointments ...the blade is well crafted almost in the Gladius style with a nice blood groove and easily ready to be sharpened. just got the blade yesterday. 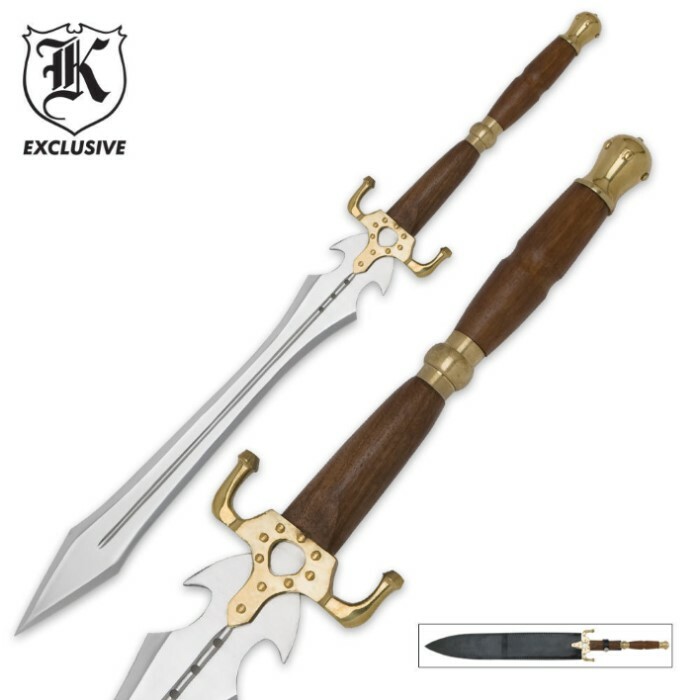 expected it to be longer at first glance, but then relized that it was as long as my arm, the perfect short sword. shipping was faster than any other shipping online, but while the blade was slightly twisted, however it is hard to see unless looking right down the blade. 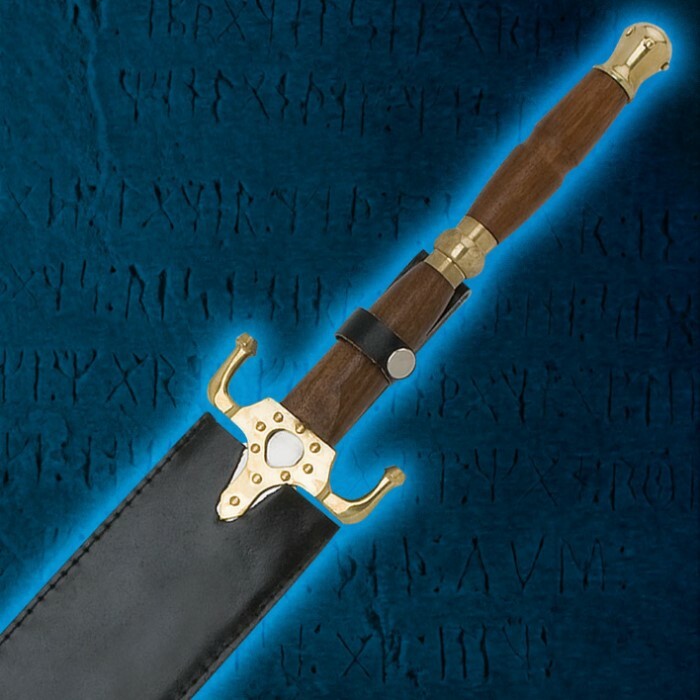 the scabbered is great for holding the sword, and the belt loop if just right. however, the sword is heavier than I expected, which is good. all in all, a good first sword for a starting collection, not too sharp out of the box, and perfect for a little flair in a desplay.